The St Andrew’s Gardiner Tennis Club moved to its present position in May 1990 and has continued to thrive and develop through good leadership from its committee and the introduction of a Tennis Academy and permanent coach, Richard Bruce-Smith. Earlier coaches who were members of the Club included Mrs Maidie Parker in the 1950s and after our move to the present premises Mr Rupert Ferdinands who had in his earlier life played Davis Cup for Sri Lanka. The first meeting of the Tennis Club Committee was convened under the leadership of Rev. P. L. Forster, then minister of the Gardiner Presbyterian Church, on 15 June 1920. This committee consisted of four representatives each from the Board of Management, the Sunday School Teachers, and Senior Girls’ Missionary Union and the Young Men’s Association. Their object was to arrange for construction of a tennis court on land next to the church. It is interesting to note that the total cost of this first court was £97/2/3. The fences were erected by members of the club attending working bees. The money was raised by donations from members of the congregation. The surface of the court was earth until in September 1920 it was asphalted. The club was officially opened on 18 December 1920, with 27 members, and the first court was declared opened by Mr Forster, who then took part in playing the first set of tennis. The membership was 97 on 30 September 1921, at the end of the financial year. The church acquired the corner block of land fronting on to Burke and Malvern Roads in 1925, and two more courts were erected on this land, next to the original court. Again the club members did most of the work, the surface being earthen construction and asphalted later. These two courts were opened by the Mayor of Malvern on 30 June 1926. It was as early as 1921 that the club entered the summer competitions run by the Presbyterian Churches Tennis Association (PCTA), which some of its members helped to found. The Tennis Club joined with the Cricket Club in celebrating end-of-season activities at socials arranged by the Young Men’s Association. In 1923, at the annual social, two Tennis Club members were elected to Life Membership ‑ Mr A.S. Mitchell, the first President and Mr J.E. Elliott. 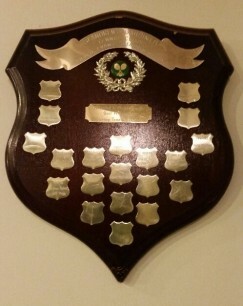 Life membership is an honour given to members giving outstanding service to the Club. Other people to be awarded Life Membership have been Mr Keith Ness in 1957, Mr Don Smith in 1969, Mr Bruce Powell in 1970 and Mrs Molly Ness in 1973, Miss Alison Hodges, Dr John Harcourt and Mr Douglas Craven in 1982 and Mr Glen Fullerton in 1983. Competition has always held an important place in the club’s activities and over the years many premierships have been won in all grades. Also much social tennis has been enjoyed. Special occasions for the club include when it won the Hartley Cup for A Grade Premiers in the Presbyterian Churches Tennis Association three years in a row in those early years 1928, 1929 and 1930. There was an agreement in the PCTA that whoever won this cup three years in succession should keep it. However the club decided that the minister, Rev. John Gray, should present the Hartley Cup back to the association for perpetual competition as the A Grade Cup and that it be renamed the Gardiner Cup. Over the succeeding years, the Gardiner Church Tennis Club again won that cup ten additional times in the years 1941, 1942, 1948, 1949, 1950, 1953, 1961, 1963, 1964 and 1967. In 1973 we saw the successful amalgamation of the PCTA. and the Methodist Lawn Tennis Association into the Combined Churches Tennis Association. This new association was the first merger of church-run tennis competition in the Melbourne metropolitan area. In 1977, agreement was made by the Combined Churches Tennis Association to join the Church of England Lawn Tennis Association of Victoria to run summer competitions. In the summer competition in 1978, five out of six of Gardiner’s teams made the finals, a feat not equalled by any other club, and we won the premiership in D Grade. 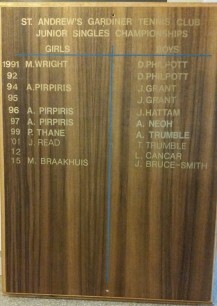 In 1979 the C Grade Premiership and A Grade Premiership were won. In 1980 five of our seven teams were in the finals, with the No. 1 A Grade Team winning the premiership for the second successive year, and in 1981 the A Grade team was premiers again, that is, three in a row, repeating that event of 1928, 1929 and 1930. It was the socials held in the Church Hall and later, dances and a square dance club formed in the 1950s, that met the needs for fellowship and fun of members and friends. In 1959, the Club was honoured by being asked by the church to arrange and conduct the first dance to be held in the recently opened Parish Hall on the site of the Sunday School Hall. Then there were the Point Lonsdale weekends held at the TocH Children’s Camp each year from 1955 to 1972, and Crazy Whist evenings, theatre nights, progressive dinners and later barbecues, adding to fun and fellowship. In 1936-37 the Club had to move because the stones from St. Andrew’s Church, Carlton, were deposited on the tennis courts prior to the rebuilding of these stones into the present St. Andrew’s Church. The Tennis Club found courts in Kerferd Road, Glen Iris, and leased them, paying 1s4d per member present each Saturday afternoon. In 1943 the Club disbanded because people had joined the armed forces and because of the difficulty in obtaining tennis balls. However, in 1944 it reopened, hiring two porous courts and two asphalt courts each Saturday afternoon from Mr Falls. Competition matches were recommended in 1946 after their suspension in 1942. The courts were opened by the Rev. J.E. Owen, the minister, and with his encouragement and joy of playing tennis, the club flourished with 70-80 young and not-so-young people enjoying tennis and good fellowship together. An anonymous donor presented two umpire stands in memory of the Rev. J.E. Owen who died in 1965, to remind all who sat on them of his service to the young people in the Tennis Club. In these early years at the present courts, there was no clubhouse and players entered the courts from Great Valley Road ‑ those with cars driving over the paddock, parking under the wattle trees at the eastern side of the courts. The entrance to the courts was changed to the western end when those who owned cars could no longer put up with the cows from the College of the Bible which grazed in the paddock, licking off the duco! And who remembers boiling the kettle for a cup of tea in Molly Ness’s kitchen and carrying the large white teapot, milk, sugar, biscuits and crockery over the paddocks to sit under the wattle trees and partake of afternoon tea ‑ and oh! even in those days no one wanted to miss tennis and take turns to wash up the dishes. So 5 December 1953 was a grand day when the clubhouse was opened in the presence of members and many visitors. In this new era many young people were attracted to the club ‑ so many that a fifth court was opened in September 1955. A junior club was formed to meet on Saturday mornings, coached first by club members. Then in 1963 the Sporting Club Action Group of the church Session suggested that the club establish a coaching class for youngsters (10-14 years of age) with Mrs Maidie Parker supervising and coaching the young potentials and, from these young people progressing into the seniors year by year, the club took on a new impetus. Many eager players played socially and many people played competition, 6-7 teams entering summer competition each year. The teams comprised three ladies and three men. Mrs Parker retired from coaching in August 1974 and was replaced by Mr Yeates, then Mr Fernandez in 1976 who was followed soon after by Mr P. Semmens. The Tennis Club season in 1965 was highlighted by the complete repayment of all debenture money for the building of the five porous courts and the clubhouse. That task of redeeming debentures taken out in 1949 seemed immense, but over the years reductions had been made until in December 1964 the committee decided to clear the indebtedness. To celebrate this a dinner was held, at which past and present members enjoyed a lavish feast. Club championships have always been a feature ‑ a ladder having been compiled in the 1920s, 1930s and 1940s, for members to challenge each other in singles and doubles until they reached the top. Club championships were started again in 1966, being a prelude to the summer pennant competitions. 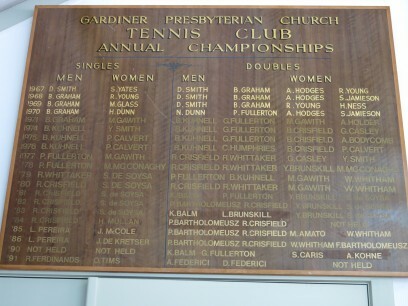 Before 1966, and from the earliest times, the club has participated in Presbyterian Churches Tennis Association inter-club competition, winning many championships in all grades. 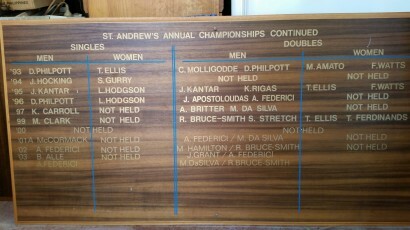 The club also had players good enough to play in the Finchley Shield, played annually for the Church Interdenominational Competition in Melbourne ‑ a very keen and hard-fought arena of tennis. 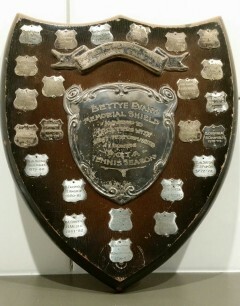 It was in 1961 that one of our much-loved members died and her husband, Mr Claude Evans, also a member of the Club in past years, presented the Bettye Evans Memorial Shield, to be given to the lady and gentleman with the highest match averages gained in summer tennis competition. This trophy has brought much enjoyment and keenness to tennis and is very much sought after by all members. There are three other trophies presented each year ‑ two introduced in 1975, the Best Clubman Award and the Most Improved Player Award, and the third the Yvonne Brunskill Ladies’ Trophy for outstanding performance on and off the court was introduced in 1979. It was stated in the Annual Report in 1964 that ‘we take comfort from the fact that our advisors assure us that the Freeway is not likely to be upon us until such time as the courts are in need of further attention!’ Later in the report for 1966 we read ‘If the South Eastern Freeway manages to weave its way between Scotch and St. Kevin’s it will cut through our courts’. The committee had then obtained an undertaking from the Malvern Council to re-site our courts near Burke Road and the committee had started a court rebuilding fund. So for 19 years the club has had the freeway hanging over its head, but has battled on and accomplished many satisfying and wonderful deeds in that time. 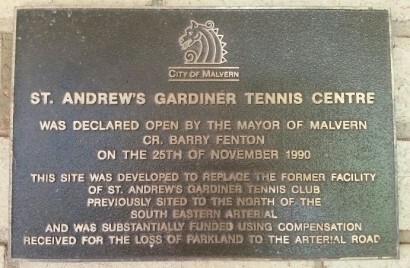 On 25 June 1977 at a Special General Meeting it was resolved to change the name to St. Andrew’s Gardiner Tennis Club. It was only in 1970 that the Session allowed tennis to be played on Sunday afternoons. The courts are now used every day of the week by ladies’ groups, young people being coached and teams practising and, of course, social and match play at the weekends and weeknights. The five porous courts and clubhouse were not very attractive in July 1986, with mounds of earth towering over them. Yes, that freeway had come to us and we were relocated south of Kyarra Road with five new courts and a new clubhouse. In April 2015 the kitchen and flooring was replaced, with the club, some very generous member donations and council contributing towards the cost.